SoftPlanet makes it possible for everyone to get free Torch Browser download directly from our servers. There is no registration needed for downloading. Who doesn't use the Internet these days? The huge choice of programs for web browsing can lead us to the normal question: Which one is the best? Well, it is hard to answer it, but in general we can say that it will be the fastest, the most secure and full of features web browser. Torch Browser 39.0.0.9309 is an excellent candidate for that title, because it includes all these plus many more functions. Like all web browsers this one is free and can be downloaded, setup, and used in minutes. 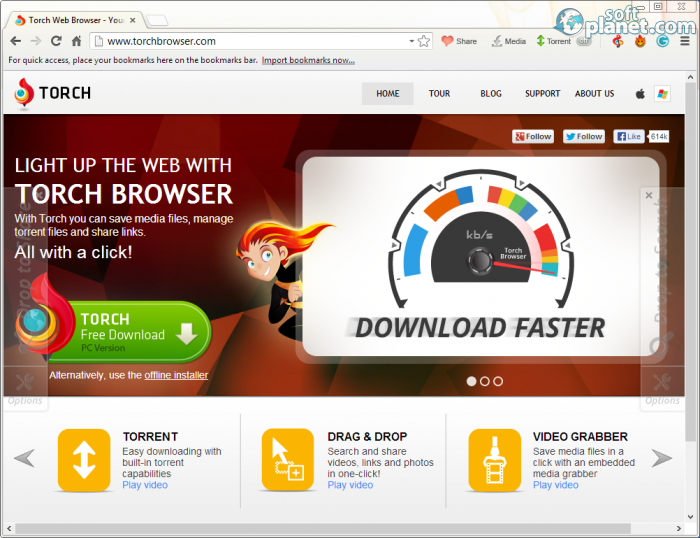 Torch Browser is a freeware program and is Chromium-based which means that it is compatible with all add-ons and extensions available in the Chrome store. It has a built-in BitTorrent client which allows users to directly download torrent files. 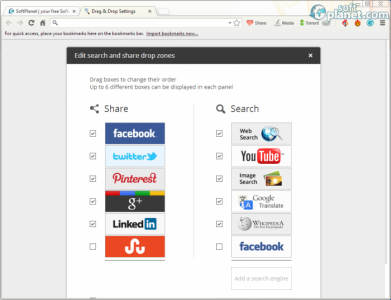 Moreover, you can share audio, videos and websites directly in your Facebook and Twitter accounts. 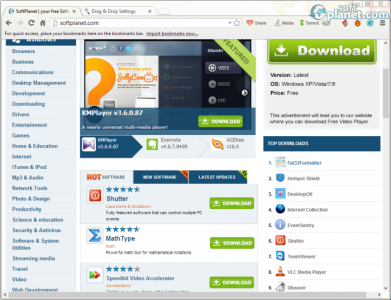 This app also has an integrated download accelerator, media grabber and supports drag-and-drop technology. At the same time the special security features help to protect your safe web browsing. 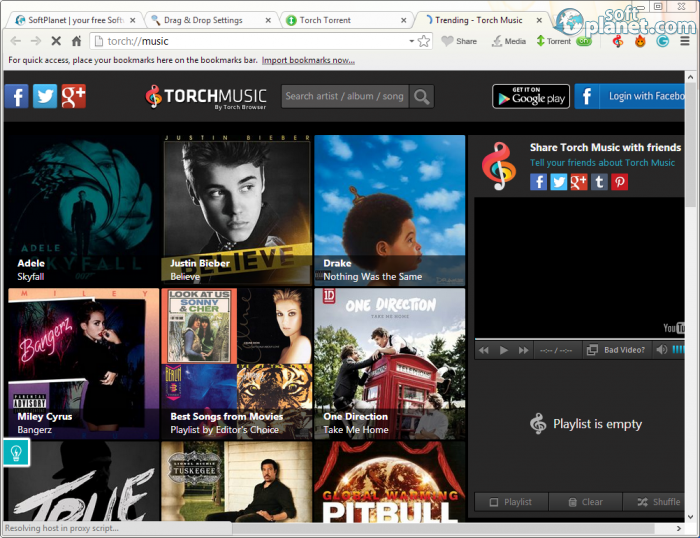 Because it is based on the Chromium source code, Torch Browser has a look that is very similar to Google Chrome. Tabs, menus, icons, settings and features are absolutely the same as in Chrome and only the new features make the difference. One of them is very useful for real because it increases download speed by firing-up your data download. Security, which is very important, is also raised to the top and you can surf the web without thinking of any viruses, adware, trojans or malicious websites. You can use this program and its features exactly the same way like you do with Google Chrome. The Bookmarks bar, Edit, Zoom, downloads, etc. are the same. The newly added features will show up in the upper right corner and you can quickly learn how to use them. Torch Browser has an icon called Hola! This feature allows you to view web sites that are otherwise censored. This feature is a free, configurable VPN service and can help you to eliminate all problems related to your location and IP address. 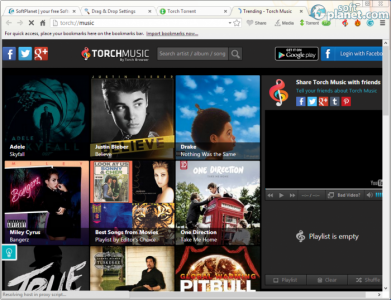 Torch Music is another function of this application that lets you listen music, share it with your friends and discover new as well. Users can search through millions of music videos, create playlists and grab your preferred media in any of the supported file formats: MP3, FLV, MP4, MOV and more. In conclusion we can add that Torch Browser 39.0.0.9309 is available for Mac OS X too. This and all things stated above lead us to the conclusion that the program evolves and continues to add more features and functions. This is one of the major reasons why we strongly recommend it and give it a high rating on our chart. Our security scan shows that Torch Browser is clean from viruses. The current version of Torch Browser has been scanned by our system, which contains 46 different anti-virus algorithms. That ensures that Torch Browser 39.0.0.9309 is 100% safe for your computer.